During a career that lasted from 1865 to 1908, H.H. 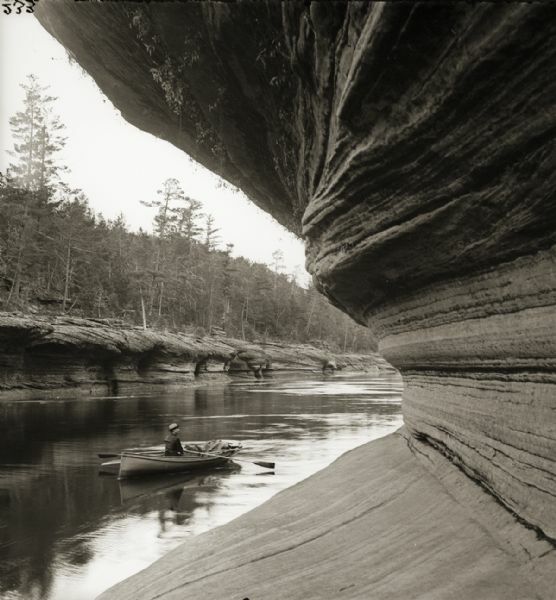 Bennett photographed the rugged landscape of his beloved Wisconsin Dells and became one of the premier landscape photographers of the era. 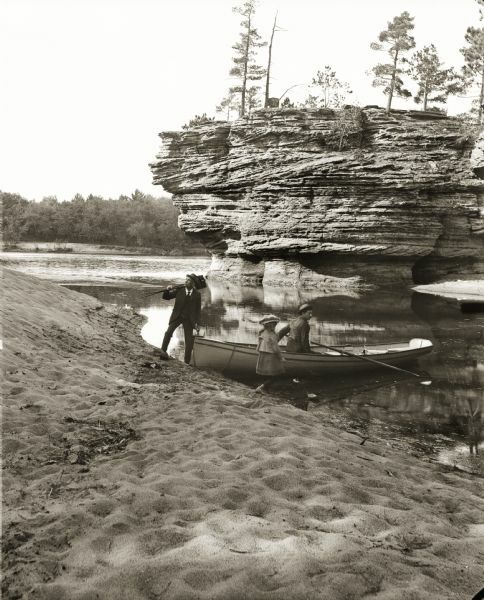 He captured the Wisconsin River, its rock formations, tourist visitors, lumber rafters, Ho-Chunk residents, steamboats and much more. Bennett loved the natural landscape of the river and spent his life conveying its beauty and many moods to the public. As a photographer he also traveled the state and regions nearby to create stunning images of Milwaukee, Minneapolis and Chicago. In Milwaukee Bennett applied his artistry to street scenes and the harbor; in Minneapolis he focused his lens on the winter carnival and its ice palace; in Chicago he created unique images of popular large-scale panorama paintings such as the Gettysburg Cyclorama and the Columbian Exposition of 1893. For the Exposition, he also photographed Wisconsin state educational, welfare and penal institutions. 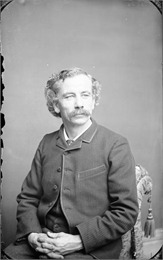 Noted landscape photographer Henry Hamilton Bennett was born in Farnham, Canada, on January 15, 1843, the eldest of 12 children of Harriet A. Houghton Bennett (1819-1896) and George H. Bennett (1810-1894). In 1857 H.H. Bennett traveled to Wisconsin with his father and his uncle, George Houghton, a photographer, and in 1858 George Bennett settled the entire family in Kilbourn City, later renamed Wisconsin Dells. During this period Henry Bennett worked as a carpenter. In 1861 Bennett enlisted in Co. E of the 12th Wisconsin Infantry along with his brother Edmund (1844-1906). He participated in several engagements including the siege of Vicksburg, and was severely injured because of the accidental discharge of his own gun. Because his Civil War injury made a return to carpentry impossible, Bennett purchased the Kilbourn tintype portrait studio of Leroy Gates in the spring of 1865. His brother George Bennett moved to Wisconsin to enter into a partnership with him. Demand for portraiture was limited, and George shortly returned to Vermont. Henry Bennett used this opportunity to explore the Dells area, hauling his cameras and portable wet-plate darkroom with him to seldom-seen locations. It was characteristic of his aesthetic sense and painstaking attention to detail that Bennett would sometimes wait hours for just the right light. Realizing that his economic livelihood was tied to the tourist potential of the Dell's scenic wonders, Bennett began to develop a market for his landscape photographs. As early as 1868 he was selling stereoscopic views to traveling agents throughout the country. His first stereo catalog, "Wanderings Among the Wonders and Beauties of Western Scenery," appeared in 1883. 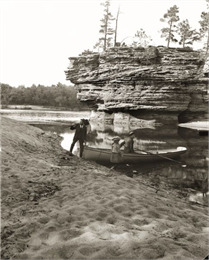 Bennett clearly understood how stereographic photography could enhance the caves and rock formations of the Dells, and his work became very popular, effectively competing with the large national distributors. Bennett also contributed to guidebooks and promotional literature issued by the Chicago, Milwaukee and St. Paul Railroad. Because of his contribution to the development of tourism in the area, Bennett is sometimes referred to as "the Father of the Dells." Bennett conceived and constructed several inventions including a revolving solar printing house, a tilting camera back, a portable darkroom, and a print-washing rack and a machine for cutting and mounting stereographs. Other innovations for which he was responsible include a stop-action shutter which made possible the famous 1886 photo of the leap at Stand Rock. This instantaneous shutter was also used to capture the 40-subject "The Story of Raftsmen's Life on the Wisconsin River" in 1886. At Bennett's studio, which was constructed in 1875 with the support of his friend William H. Metcalf, visitors could purchase photographs and souvenirs. Eventually it became an informal tourism information bureau. When the invention of roll film at the end of the century allowed the vacationing public to take their own photographs rather than purchasing professional views, Bennett added authentic crafts produced by Native Americans to the range of materials sold. An idealistic conservationist, late in his life Bennett organized the opposition against the dam project on the Wisconsin River, which eventually flooded many of the Dells natural attractions in 1909. Bennett conveyed his conservation ethic to his children. One of his sons-in-law, George Crandall, eventually purchased most of the land bordering the Dells, and his granddaughters, Lois Crandall Musson and Phyllis Crandall Connor, gave that land to the University of Wisconsin Alumni Research Foundation. On January 22, 1866, Bennett married Francis Irene Douty. Three children were born to them: Hattie M. Snider (1867-1894), Nellie I. Crandall (1871-1952), and Ashley C. (1869-?). Mrs. Bennett died on August 28, 1884. On March 25, 1890 Bennett married Evaline H. Marshall (1863-1949). They became the parents of two daughters, Miriam (1891-1971) and Ruth Bennett Dyer (1895-1982). Eventually Mrs. Bennett joined her husband in the studio, assuming the majority of the portrait work while Bennett did the outdoor views. Bennett died from Bright's disease on January 1, 1908, at his home. After his death Evaline Bennett, Miriam Bennett, and Ruth Bennett Dyer continued to operate the studio. Eventually operations were taken over by Ruth's daughter Jean and her husband, Oliver Reese. In addition to operating the commercial business, the family preserved Bennett's negative collection, continuing to print from the glass plates until the late 1990s. They also established a museum at the studio and worked to bring Bennett's legacy to public attention. Jean and Oliver Reese donated the studio and the entire Bennett collection to the Wisconsin Historical Society. The studio reopened as a Wisconsin Historical Society historic site in 2000. More than 650 of H.H. Bennett's photographs may be viewed online at the link below. The entire photograph collection, as well as Bennett's detailed records of his life and career may be viewed at the Historical Society's Archives Research Room. See information on Visiting the Library and Archives. In 1963 Bennett's reputation was enhanced by John Szarkowski of the Museum of Modern Art when he selected Bennett as one of the nation's top landscape photographers. "A contemporary of the frontier landscapists, Bennett worked a generation behind the frontier, in the vacation town of Wisconsin Dells. From 1865 through 1907 he made and remade, with variation and refinement, what was essentially the same picture. It showed a fairy-story landscape, rugged and wild in half-scale, with enchanted miniature mountains and cool dark caves; and in this landscape a human reference, most often a figure, neatly dressed, poised, superior to the site, but with friendly feelings toward it. It was a portrait of the American discovering an identity with the wild world."